Does Carmel Visual Arts sell art supplies? Being the studio/gallery that we are, we have a small selection of art supplies for those last minute needs. Most of the time we are stocked with a variety of canvas panels, charcoal, newsprint pads, Permalba white oil paint, and Gamblin’s Gamsol and Solvent-Free Gel. In addition, we do sell individual Plein Air folding metal easels and studio lights that can be attached to most easel setups. Is there an art store nearby? Imagine Art Supplies 309 Forest Ave, Pacific Grove, CA 93950 (831) 372-1388. Locally owned complete art store. Limited brands, but you can get nearly anything you need if you forgot something for a workshop. Spencers Stationery 233 Crossroads Blvd, Carmel CA 93923. This store is great if you are in need of a great sketchbook, pencils, pens, or paper. 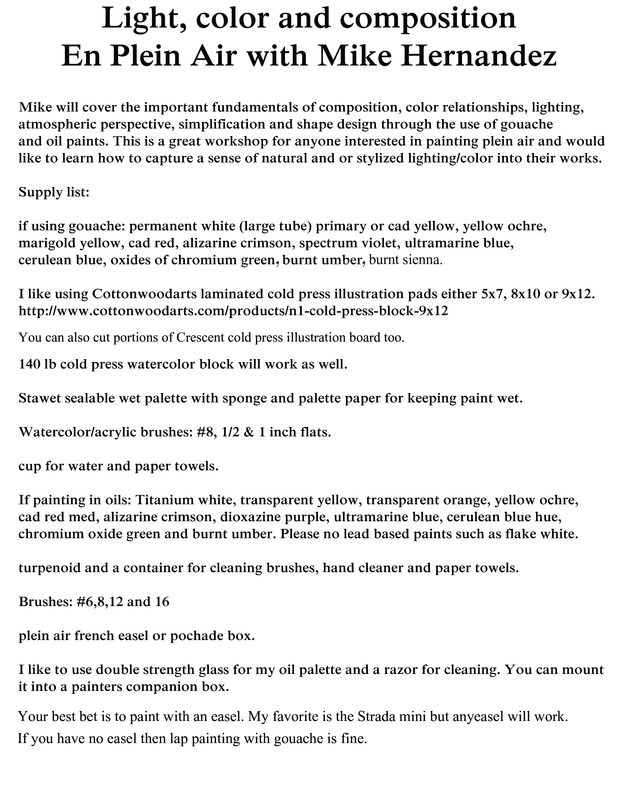 However, the store does not have any oil painting supplies, canvas materials, or sculpting tools. What supplies will I need for my class/workshop? Listed under the workshop page on the Carmel Visual Arts website is our upcoming workshop lineup. Each workshop has its own supplies list readily available in a flyout menu. What is CVA’s cancellation policy for workshops? Is CVA equipped with WiFi? Yes, please feel free to bring a mobile device with you to the studio. Our WiFi is password protected, please ask any CVA staff member for the password. Do I need to bring my own easel to the workshop? What about Monday night figure drawing or Wednesday morning painting class? Carmel Visual Arts has about a dozen studio easels, enough to accommodate those without one if need be. You are encouraged to bring your own self-contained portable easels. Our plein air painting workshops require you to bring your own portable easel. However, studio workshops are more flexible. All easels will be set up for Monday figure drawing night and Wednesday morning painting class. Where should I stay in Carmel? Carmel is full of unique hotels, and comfy inns and AIRBNB has many offerings around the area. They vary in price depending on the location. Below are the two closest hotels to our studio. Carmel River Inn offers a 15% discount to students attending a workshop at Carmel Visual Arts. Use discount code “CVA” in the “password” field to get your special rate. NOTE: When you book online at http://carmelriverinn.com/ or you can call directly at 831-624-1575. Carmel Mission Inn – Located directly next door to Carmel Visual Arts. Dog-Friendly, Walk to class. http://carmelmissioninn.com or you can call directly at 800-348-9090. Depending on whether or not you are signed up for a plein air workshop, or where you are staying will determine if you need a vehicle. Some workshops will sometimes travel down the Big Sur coastline or into Carmel Valley. You can usually arrange a ride with someone from the workshop. If you want to wander around the area when the workshops are not in session, it may be a good idea to rent a car if you are enrolled in one of these workshops. Carmel has a decent public bus transportation system, look up ‘Carmel MST’ for more information. 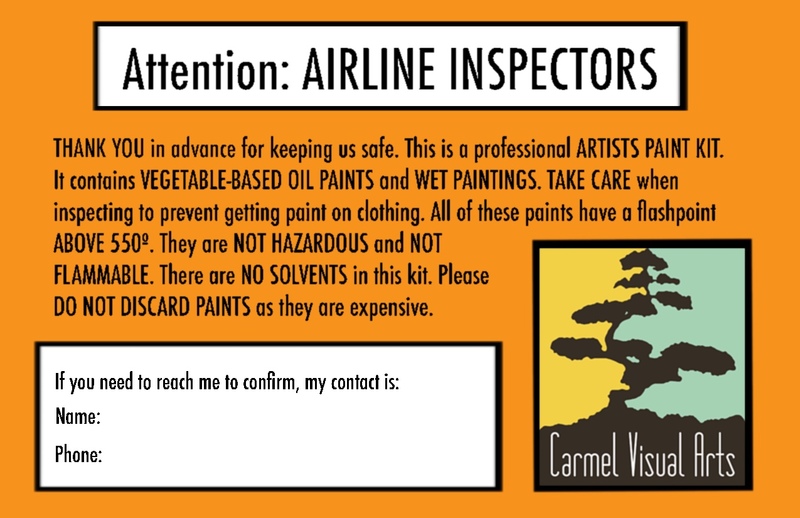 You may want to check the TSA website if you are unsure about flying with your materials. Flying with odorless mineral spirits is prohibited, but for a small fee, we offer Gamblin’s Gamsol for those who need it. What is there to do between workshop times?